This month’s patient spotlight has quite a way with words! 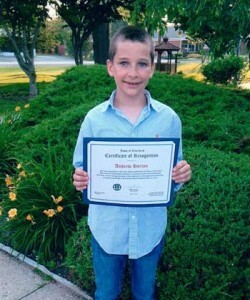 Andrew Horton recently entered and won a bicycle essay contest sponsored by the Riverhead Alternative Transportation Committee in conjunction with Cornel Cooperative Extension and Twin Forks Bicycle. He was asked to write an essay on the health benefits of bicycling, bicycle safety, environmental benefits, the importance of bicycling for leisure, or the history of bicycling in Riverhead. Andrew’s essay was judged by members of the Riverhead Alternative Transportation Committee and scored based on content, grammar, and neatness. As one of five winners chosen, Andrew was presented with a reconditioned bicycle and a new helmet as reward. His accolades did not end there. While at the Riverhead PAL Bike Rodeo to accept his prize, Andrew won the award for being the “safest rider” in his age group by competing in a contest of bicycle skills. His prize was a four-ticket family pass to the Long Island Aquarium. "Do you like bicycling? I love it! It makes me feel so alive. Mentally, it releases feel good emotions, and it also benefits your physical being. You get great exercise from bicycling. Many people don’t think of the environmental benefits it provides as well. Your health professionals recommends at least 30 minutes of physical activity a day. Why not bicycle? Bicycling doesn’t feel like hard work or forced exercise because it is so easy and enjoyable. Bicycling is a great way to burn off all those extra calories. Bicycling improves the tone in your hips, thighs and muscles, as well as increases your heart rate. Cycling is a stress free way to clear the mind. In fact it also offers great physical therapy for an individual. Cycling is a good way to build stamina as well as reduce pollution for the environment. There are bike trails throughout the east end which can offer many perks. You can enjoy the scenery, the birds and beauty of the season. The Milton L. Burns Park behind Main Street on Peconic Avenue is a popular spot. Along the riverfront is also a great way to enjoy nature. The North Fork offers many bicycle trails if you want to take advantage on a spring day. Last but not least, bike riding is fun. You can enjoy your family and get the exercise you’re looking for. Bikes are also more affordable than fueling cars. I hope if you try bike riding you will love it!"